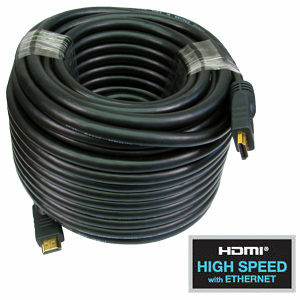 30m Long HDMI Cable Active High Speed with Ethernet. 4k x 2k Resolution Support. Please note active HDMI Cables are directional and must be installed the correct way round. Our range of Active HDMI cables feature boosters in the connectors which allow for longer cable lengths. Please note the cables are one directional and need to be plugged in correctly. The output connector is marked "OUT". Newlink 2 Way HDMI Splitter, Distribution Amplifier. Duplcates an HDMI signal to 2 TVs HDMI female input port, 2x HDMI female output ports. 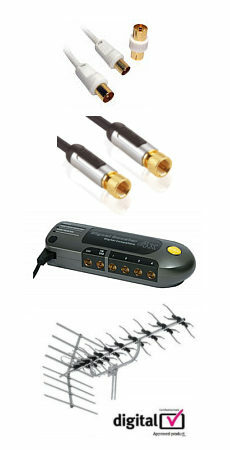 Splits and replcates without signal loss or degradation. Supports HDTV resolutions 480p to 1080p and 3D. High performance 1.65GHz bandwidth. HDCP compliant. Cascadable up to 3 times. All metal housing Power supply included.